This being Belgium, in the run-up to Christmas we visited a Christmas market. Me being me, we found a stall selling beers. This stall had a number of beers from a brewery I hadn’t heard of before — the Grutte Pier brewery in the Netherlands. So I bought a selection and have been, slowly, working my way through them ever since. The first one I tried was the Dubbel. This is normally a safe bet for me but, in this case, it was way too sweet. Obviously, I finished the bottle, but it’s not a beer I would pick up again. Surprisingly enough, the Tripel proved to be a lot better. Surprising, because I don’t usually like Tripels, but this one was nicely dry and went down very well indeed. This makes it one of the very few Tripels that I would buy again. And again. The blonde was a bit watery, but this probably doesn’t tell you anything as I usually find blondes a bit watery. If you like Heineken, you’ll probably be happy with this. Similarly the Bretttûne was a bit bland. Again, if you like blondes you might like this, but it’s not for me. The wood smoked double Bock, however, was a lot better. For a winter warmer, it’s quite light and has a nice smokiness to it. While a bit on the sweet side, the sweetness was far from overwhelming. The Lente Kuit was a tad yeasty but didn’t have a lot of flavour to it. And finally there was the Friese Boezem, another tripel and a very typical tripel at that. It was better than average but not that great. All in all it was a bit disappointing. When I picked up this pack I was expecting to enjoy most of the beers. While I would happily drink the tripel again, and would be more than willing to have a few of the bocks on hand next winter, most of the beers were drinkable but unexceptional. At least I got a free glass out of it. Untappd is yet another social network, this one for beer drinkers, and I have been on here for a while. Yesterday they emailed me an overview of my year in beer: what I’ve been drinking and where I’ve been drinking it. It’s interesting, to me at least. But first a disclaimer. I don’t check in every beer I drink — this is especially true if we go out and I’m drinking the same beer at the same location, in which case one check in can account for several beers. It’s also true that there are occasions when looking at an app on my phone would be inappropriate. So I don’t. On the other hand, I do try to check in any beers that I haven’t tried before, mainly so that I can keep track of what I did or didn’t like when I find myself looking at the same beer six months later. Consequently, Untappd will overstate the number of new beers I have tried and understate the numbers of beers that I know I like. And this is apparent in the results. Normally, I prefer darker beers (Stouts, Belgian Dubbels, Dark Ales) but will happily switch to IPAs when summer rolls around and I want something a bit more refreshing after a day in the garden. If asked, I would tell you that my preferred beers are Chimay Blauw, Westmalle Donker and Tongerlo Donker and, in summer, I tend to drink St. Martin’s IPA unless I can get hold of Bass Pale Ale. According to Untappd, however, I have worked my way through 18 unique beers from 16 breweries representing 14 dinstinct styles. I had no idea my drinking was so varied. From these, however, Untappd thinks that my preference is for Belgian strong golden ale, specifically Duvel. Tellingly, my most checked in location is the Middle-Eastern restaurant from which I buy takeaway pizzas every Wednesday. Duvel is my most checked in beer and, of the rest of my top five check ins, Westmalle, Chimay and Tngerlo occupy positions two, four and five respectively. I suspect the Chimay Blauw would rank higher if more bars and (especially) restaurants sold it. I was a bit surprised to see Palm Special ranked third most checked in beer until I noticed that the nearby cinema is my third most checked in location. Guess what they sell. The rest of my check in locations are a variety of restaurants and bars and I was mildly amused to note that the app has decided that England and Wales are a single country. I’m not really sure where I’m going with this but, based on the information I have given it, Untappd thinks that I do most of my drinking when sitting alone and waiting for a pizza. If nothing else, this does show how easy it is to skew a data set and why, when you see a survey, it’s always worth asking about how the data was gathered and what methodology was used to analyse it. And if the survey relies on self-reporting of data, you can be sure that the errors and omissions will be glaring. And finally, if you are on Untappd, drop by and say hello. This is what happens when you apply German ingenuity to real problems: Germany’s Wacken hard rock festival gets beer pipeline. An underground beer pipeline is being laid for the Wacken Open Air (WOA) hard rock festival, which kicks off in northern Germany in August. It is part of a new 7km (four-mile) pipeline network, which organisers say will make the event more eco-friendly. The beer flow rate should reach six glasses every six seconds, thanks to the 35cm (14-inch) diameter pipeline. I hope they’re using different pipes. Free alcohol for MPs was introduced in the late 1990s to prevent deputies from going to bars during debates. – EUobserver reporting that the Belgian parliament has rejected advice from an independent integrity committee to ban the distribution of free beer and wine to MPs. Politico reports that the Belgian beer culture was added on Wednesday to UNESCO’s cultural heritage list for being deep-rooted in the country with breweries, beer tasting associations, museums and events in every province of Belgium. 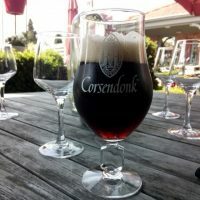 “It is the unparalleled diversity of the art of brewing and the intensity of the beer culture, as a part of our daily lives and at festivals in our country, that make this beer culture a part of the identity and the cultural heritage of the entire country,” a statement from the culture ministers from the French, German, and Dutch speaking communities of Belgium said. Belgian Prime Minister Charles Michel called upon people to visit the country to taste the beers. With 214 breweries (PDF) in the country, visitors may find it best to extend their stay. In my younger days my usual beer was stout. Guinness by default but I always preferred Murphy’s when I could find it. While I have retained a preference for darker beers, living in Belgium has led to my current tendency to go for Abbey and Trappist Dubbels. On Saturday, however, I discovered that Belgian stout is a thing. While stocking up, I saw a crate of Hercule Stout sitting in the drink shop demanding that I pick it up. So pick it up I did and I took it home and (later) opened a bottle. It’s fantastic. 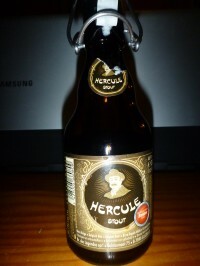 Hercule Stout is dark, creamy, smooth and everything I want from this type of beer. I will certainly be going back for more. 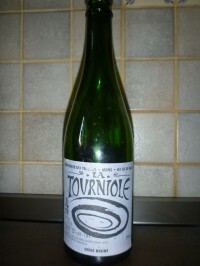 It’s not often that France comes to mind when I start thinking about beer, but when we were in the country last year I picked up several bottles of La Tourniole. Last night, I finally got around to opening one of these. La brasserie du Trièves is an artisan brewery, based in Mens, and they do a number of traditionally brewed beers. Brown, blonde and amber were the ones I picked up at the time, and it was the brown that I opened last night. The beer has a very rich, very full flavour with a nicely creamy head that reminded me a lot of Pilaarbijter bruin. It’s also very smooth and went down very easily indeed. I don’t know what, if any, distribution arrangements La Brasserie du Trièves has but when I am next in the area I will certainly be picking up some more of this. Only in Belgium could a painting by Pieter Breughel inspire a beer. In his painting “The Flemish Proverbs” Pieter Breughel the Elder depicted several Flemish proverbs and expressions amongst which “He’s a pilaarbijter” (“pillar biter”): He’s a hypocritical man. The beer is Pilaarbijter from Brouwerij Bavik and it isn’t hypocritical at all. In fact, I found this traditional Flemish brown ale to be very drinkable indeed. It’s light, pleasant and packs quite a complex aftertaste – one that I am still picking my way through. And yes, that does mean that I will be stocking up in the near future. And if you were wondering about “The Flemish Proverbs” by Pieter Breughel, here it is.